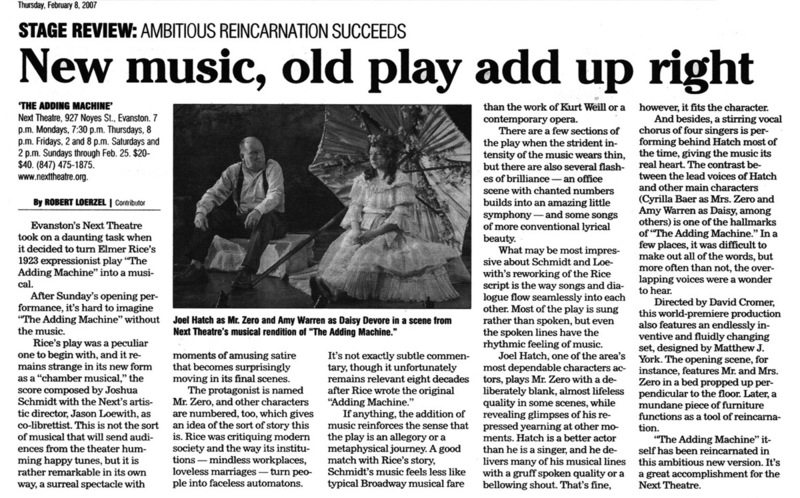 This review by Robert Loerzel originally appeared in Pioneer Press on February 8, 2007. Evanston’s Next Theatre took on a daunting task when it decided to turn Elmer Rice’s 1923 expressionist play “The Adding Machine” into a musical. After Sunday’s opening performance, it’s hard to imagine “The Adding Machine” without the music. Elmer’s play was a peculiar one to begin with, and it remains strange in its new form as a “chamber musical” composed by Joshua Schmidt with the Next’s artistic director, Jason Loewith, as co-librettist. This is not the sort of musical that will send audiences from the theater humming happy tunes, but it is rather remarkable in its own way, a surreal spectacle with moments of amusing satire that becomes surprisingly moving in its final scenes. If anything, the addition of music reinforces the sense that the play is an allegory or a metaphysical journey. A good match with Rice’s story, Schmidt’s music feels less like typical Broadway musical fare than the work of Kurt Weill or a contemporary opera. There are a few sections of the play when the strident intensity of the music wears thin, but there are also several flashes of brilliance — an office scene with chanted numbers builds into an amazing little symphony — and some songs of more conventional lyrical beauty. What may be most impressive about Schmidt and Loewith’s reworking of the Rice script is the way songs and dialogue flow seamlessly into each other. Most of the play is sung rather than spoken, but even the spoken lines have the rhythmic feeling of music. Joel Hatch, one of the area’s most dependable characters actors, plays Mr. Zero with a deliberately blank, almost lifeless quality in some scenes, while revealing glimpses of his repressed yearning at other moments. Hatch is a better actor than he is a singer, and he delivers many of his musical lines with a gruff spoken quality or a bellowing shout. That’s fine, however — it fits the character. And besides, a stirring vocal chorus of four singers is performing behind Hatch most of the time, giving the music its real heart. The contrast between the lead voices of Hatch and other main characters (Cyrilla Baer as Mrs. Zero and Amy Warren as Daisy, among others) is one of the hallmarks of “The Adding Machine.” In a few places, it was difficult to make out all of the words, but more often than not, the overlapping voices were a wonder to behold. Directed by David Cromer, this world-premiere production also features an endlessly inventive and fluidly changing set, designed by Matthew J. York. The opening scene features Mr. and Mrs. Zero in a bed propped up perpendicular to the floor. Later, a mundane piece of furniture functions as a tool of reincarnation. “The Adding Machine” itself has been reincarnated in this ambitious new version. It’s a great accomplishment for the Next Theatre.